Neil Robertson and Mark Selby both battled their way into the last 16 of the BetVictor Welsh Open with narrow 4-3 victories on Wednesday. Robertson came from 2-1 down to beat Jamie Cope, making breaks of 94 and 113 to get to 3-3 then edging a tense decider 63-23. 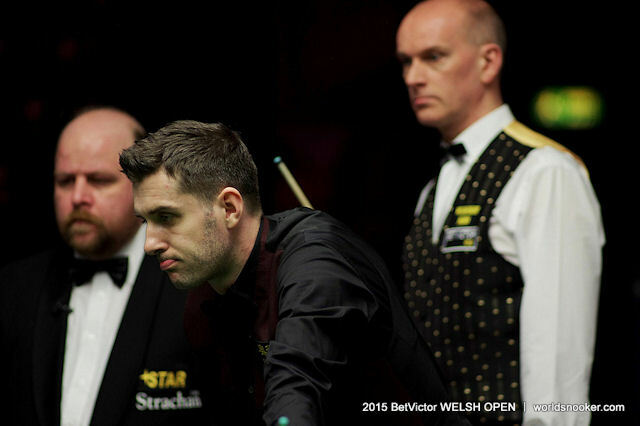 World Champion Selby needed two hours and 56 minutes to beat Peter Ebdon 4-3. Selby led 3-1 after breaks of 65, 56 and 91, but Ebdon recovered to 3-3 and had a chance in the decider but missed a tricky black on 35 with three reds left. Selby eventually cleared from yellow to pink to improve his chances of back-to-back ranking titles having won the recent German Masters. Michael Georgiou reached the last 16 of a ranking event for the first time by beating Graeme Dott 4-3. Londoner Georgiou, who came through Q School last year, let slip a 3-1 lead, but then came from 33-0 down in the decider to win it with runs of 29 and 32. “It’s an amazing feeling. I went into the match confident and I squeezed through in the end,” said Georgiou. Ricky Walden saw off Martin Gould 4-2 despite a top break of just 43.